This is another book about ECT which I found very helpful and informative. It is forwarded by John MacArthur, R.C. Sproul and D. James Kennedy. It is a longer treatment of more than 300 pages including six appendixes. You also get the ECT document reproduced as the last appendix. Ankerberg is well known for his national talk show. I think he did a fine job of showing he can write as well. The book is filled with quotes and references to Catholic theology from the Council of Trent to the latest Catechism. 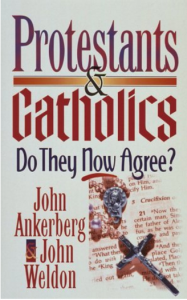 This book takes a more direct approach against Catholicism from one who has been on the front lines for a while. Guess What Has Not Changed?